The tape doesn’t lie when it comes to new Tennessee Titans offensive lineman Taylor Lewan. Lewan is a talented player who could develop into a very good offensive lineman. Unfortunately, inconsistent technique and a sometimes bad attitude oftentimes tend to overshadow the talent. Reaction was mixed when the Tennessee Titans selected former Michigan offensive tackle Taylor Lewan with the #11 overall pick in the 2014 NFL Draft. It wasn’t just the off the field issues that had people scratching their heads over the Lewan pick. Although talented, Lewan has football issues that raise some concerns as well. At 6′ 7″ and 309 pounds, Lewan is physically imposing. His height puts him at the outer end of effectiveness for an offensive lineman but for the most part he manages to leverage his body well. He has 33 7/8 inch arms which is very nice but smallish hands at 9 1/4 inch. He also posted some nice numbers at the NFL combine with a 4.87 40 yard dash, 30.5 inch vertical, 117.0 inch broad, and 7.39 second 3 cone drill. Quite clearly the Titans drafted Lewan with the intention of grooming him for their left tackle spot. Conventional wisdom has Michael Oher manning the right tackle position with Michael Roos playing out the final year of his contract at his customary left tackle spot. Still, there has been speculation the Titans might get him involved sooner rather than later. It’s possible Lewan could come in and compete to start at either position though it seems a long shot at this point. It remains to be seen whether a strong training camp could have him playing right tackle in place of Oher which seems the most likely scenario. I do not believe the Titans move Roos to right tackle nor do I believe Lewan can upseat Roos from his starting position. Right tackle however is another question. 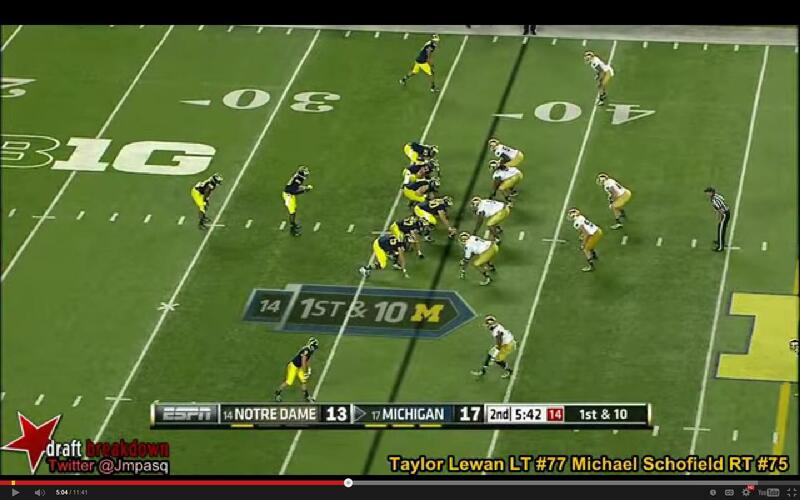 Despite watching Lewan play in college I spent several hours watching his film to analyze his game. I didn’t find any real surprises but watching him again reinforced some of my earlier thoughts. The Titans took a huge risk in drafting Lewan even without consideration of his off the field issues. While talented, he is extremely inconsistent with his technique and play. Also, he tends to lose his cool and engages in extra curricular activity that leads to costly penalties. He has a frustrating tendency to grab jerseys and facemasks when he gets overwhelmed by opposing defensive linemen as well. Let’s start with this bowl game and Lewan versus Jadaveon Clowney. Lewan can expect to see a ton of Clowney since he was the first overall selection by the Titans AFC South rival the Houston Texans. Lewan starts by grabbing Clowney close to the facemask and ends up with a handful of hair and some jersey too. Not the first or last time he would grab a facemask to avoid getting beaten either. Lewan is talented but struggled against the better players he faced even those not named Jadaveon Clowney. You see similar struggles in this game where he faced William Gholston. 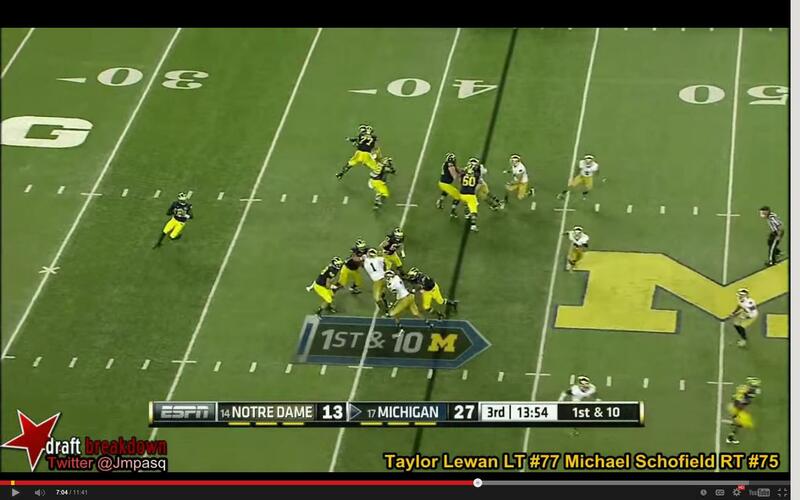 Lewan tends to get overpowered and his fundamentals take a beating when that happens. It leads him to overcompensate by either doing something dumb or by losing the play. Let’s look at this play in particular. Not really egregious by any means but that extra punch also isn’t necessary. The extra curricular activity occurs away from the play as well. Not only does it add nothing but it could cause his team greatly in penalty yardage. The fundamentals issue can be cured by a commitment to technique, training and film study. The tendency to retaliate in a negative way is troubling. The Titans have a fairly young offensive line with right guard Chance Warmack and center Brian Schwenke entering their second season. Roos should be a Titan one more year. After he is gone only Andy Levitre and possibly Michael Oher will be left as the leaders in the offensive linemen room. Hopefully those guys can impress upon Lewan how important it is to work on these issues. 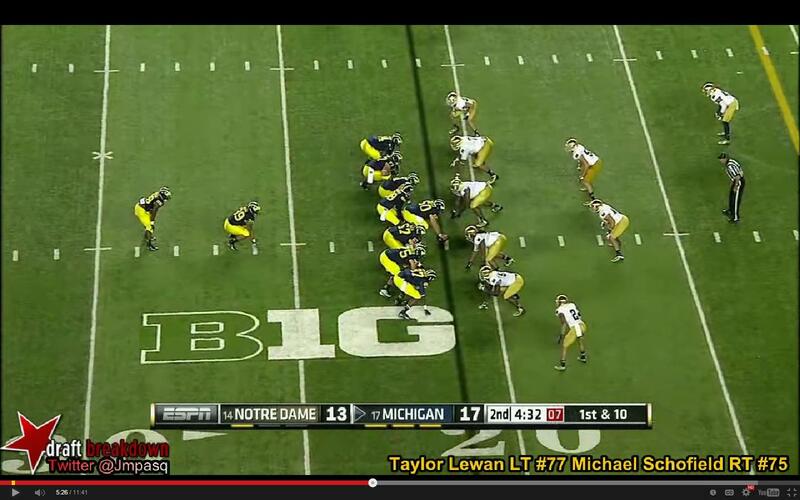 Another thing I noticed is that Michigan regularly paired Lewan with a tight end on his side. The tight end didn’t always stay in block but did often engage before releasing and heading downfield. It wasn’t uncommon for there to be two tight ends on the line beside him. That’s not to say it’s all bad where Lewan is concerned. There are good qualities you can take away from his game. On his best plays he shows outstanding footwork and nice use of his hands. He has really nice lateral movement as well. I will leave you with this which was a beautifully designed and executed screen play. After watching the film, I came away thinking Lewan was much better at pass protection than as a run blocker, which makes me wonder if he up seats Oher. He is definitely not a mauler in the mold of David Stewart. The inconsistencies you see in technique are troubling but correctable. As the old saying goes when he’s good he’s very good but when he’s bad he’s horrid. A final note about the off the field issues. While researching and watching film I came across the following information on Lewan’s off the field issues. If you want to watch the surveillance tape of the alleged assault you can find it here. I chose to focus on the football issues and also found the following information to be useful. Next Does History Help Marqueston Huff?